With over 110,000 motor vehicle collisions reported on Canadian roads every year, it doesn’t matter whether you drive to get to work or as part of your job, safe driving practices can save your life. 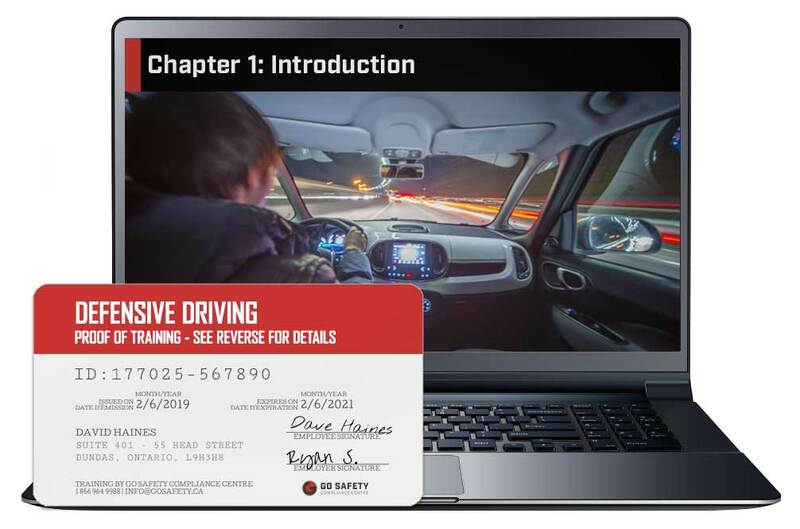 This defensive driving course will guide you through all aspects of safe driving, from basic driver safety and vehicle safety to hazards recognition and controls. Sheldon K. Verified Buyer Great presentation and it's easy to navigate the training. Reviewing material is just point and click. Patrick K. Verified Buyer Excellent course, very informative and thorough. Jasmine I. Verified Buyer Excellent source of information and resources. Immediate certificate after passing the exam. Sergei S. Verified Buyer Thank you very much guys for making my life easier. Ehsan D. Verified Buyer Easy to learn, user friendly, with the ability to pause and repeat the course material, and taking the exam as many as it is necessary! Training can be completed in three to four hours. Work at your own pace with no time limit. 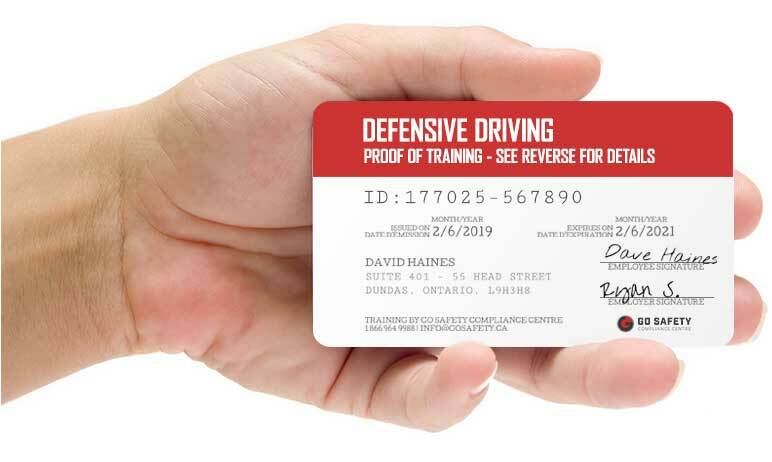 A sturdy plastic Defensive Driving wallet card may also be ordered directly from your Go Safety account for an additional fee. These hard-copy certificates are printed on durable 0.30mm polycarbonate plastic. WHO NEEDS DEFENSIVE DRIVING TRAINING? Anyone who drives a vehicle, whether it be for work or pleasure would benefit from defensive driver training. WHAT TOPICS ARE COVERED IN THE DEFENSIVE DRIVING TRAINING COURSE? If you drive as part of your job and depending on your employer’s health and safety standards, you may be required to periodically re-visit defensive driver training. Check with your employer before you begin work to make sure you are adequately trained. HOW LONG WILL IT TAKE FOR ME TO COMPLETE DEFENSIVE DRIVING TRAINING? Most students complete the course in a little over three hours, but there is no time limit. You can pause the program and pick up where you left off later. Once completed, the training material will continue to be accessible to you for review purposes. You can write the exam multiple times until you achieve the passing grade of 80%. WILL THE ONLINE DEFENSIVE DRIVING SAFETY TRAINING COURSE WORK ON MY TABLET OR SMARTPHONE? HOW CAN I ACCESS MY DEFENSIVE DRIVING RECORD OF TRAINING? WHAT HAPPENS IF I LOSE MY PERSONAL DEFENSIVE DRIVING TRAINING CERTIFICATE? CAN I PURCHASE THE ONLINE DEFENSIVE DRIVING TRAINING COURSE FOR SOMEONE ELSE?